Robert Ruiz Dominguez at a news conference Thursday, May 31, 2018. LOS ANGELES – The family of a 15-year-old boy who was shot in an arm at Highland High School in Palmdale filed a claim against the Antelope Valley Union High School District Thursday, claiming lax security at the school contributed to the shooting. Robert Ruiz Dominguez was shot around 7 a.m. May 11 at the school in the 39000 block of 25th Street West. 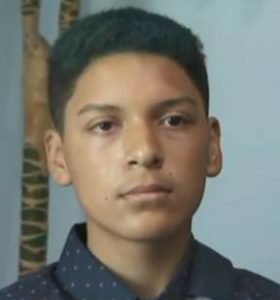 The suspect, a 14-year-old boy described as a former student at the school, was arrested a short time later at a nearby Vons grocery store. The SKS semiautomatic rifle used in the shooting was found abandoned in a nearby field. The school district issued a statement saying it was thankful no lives were lost and that the student is recovering. Gage released a photo of the teen’s injured arm, showing stitches along virtually its entire length. The legal claim filed on behalf of the teen and his sister, who was shot at but wasn’t injured, is a precursor to a possible lawsuit. Gage said the school did not have a safety plan in place, and the school resource officer assigned to the campus doesn’t start working until 9 a.m., even though students begin arriving at the campus around 6:20 a.m.
Editor’s note: Story updated to include a statement from the school district. 64 comments for "Student wounded in Palmdale school shooting files claim against District"
Local high schools start at 07:30 or 07:45, I believe. Students arrive before 07:00. Why doesn’t the AVUHSD have deputies there until 09:00???? As I recall high school we had a lot more fights after school than before. We’re all appointed to die once. A juvenile or someone under the age of 21 that has access to a gun, and justifies going to school to shoot children: 13 dead at Columbine; 26 dead at Sandy Hook; 17 dead at Marjory Stoneman Douglas, and on and on. Of course let us consider the collateral damage to the children that will be traumatized and affected for the rest of their lives. There will be another shooting, and more children will die. This nation is broken. You forgot Sante Fe Texas. You’re right. I said on, and on because there are many more. What we need to do is have each student provide a signed waiver stating they can’t sue the school for any reason. They get assaulted by staff, there’s a signed waiver, can’t sue. You randomly get shot by an assault rife, you can’t sue, we have a waiver. Similar to the ones you sign when skydiving, or bungee jumping. When they walk into 1st period on their first day of each school year, they have their vaccine records, and waiver in hand. If they don’t have them, they can leave the school. We can let the truancy court handle after that! My opinion only…From the articles I have read this boy that was shot didn’t know the other boy with the weapon. Also, the boy’s sister was almost shot, as they were both sitting at a table when the shooter exited the bathroom, shooting randomly. Per recent article, the shooter is being charged with two counts of attempted murder. Any commenter attempting to justify in any way a school shooter’s acts, whether it is Adam Lanza, Nikolas Cruz, Columbine shooters, or this boy at Highland, has misplaced their moral compass. I don’t know, but from what my child says this little victim Bullied in school. Not that guns are the answer, but parents need to teach kids right from wrong! God forbid if he had died the shooter would be spending life in prison! Folks all parents need to teach kids right from wrong!!!!!! School shootings happen cause nobody is allowed to hit their kids anymore. Gun control? Let’s start with kid control. I was afraid to miss my curfew because my mom would throw a lamp at my head. This is the generation of “my mom is my best friend” FORGET that! I feared my mom. Kids having kids does not allow parenting to happen. SAD sad times! What they did not say in that story is that the 14 year that shoot him was bully by the 15 year for the past two years. My daughter went to the school the shooting happened at and has witnessed the bulling by the 15 year . We could learn from the gun-loving country of Iceland. My opinions mean nothing. My comment about Iceland is irrelevant. Not significantly different from our socialist dictatorship of the ignorant here in sunny MexiKalifornia. So I guess every school should have an army battalion and 200 snipers and 15 cobra helicopters to make sure one kid wont get shot in the arm. Or they will get sued. I don’t know Pantarra joe, an army battalion, 200 snipers, and 15 cobra helicopters is a bit much, just for one child being shot in the arm. How about suing the parents of the shooter, after all, this juvenile brought the weapon from home. At least they should pay for medical expenses, and mental health costs for all the children that were traumatized. This boys family deserves to pay all his expenses he BULLIED that boy… There is a cause and effect in life and he decided to ruin that boys life the boy decided to ruin his back. Both of these need mental help bc either 1 or the both of them are not getting adequate love at home. I think we should just adopt a policy of hitting any school where a shooter appears with a tactical nuke. Sure, it will kill all the students, but THE SHOOTER WON’T BE GETTING ANY, so there’s justice. They spend about $15,000- $30,000 on marquees just for the outside of the school. Why not just get some dang metal detectors? They should be mandatory. I don’t understand why this hasn’t happened yet? Because to do any good a metal detector has to be manned. 15-30K for a marquee sounds like a lot of money, and it is, but it isn’t even a good scratching start towards the payroll requirements to staff metal detectors at multiple access points. Unfortunately. The way that school is set up you could limit the access points. At least when I went there. But it’d still take a lot of man power. And the SRO needs to be on campus as soon as students start arriving. It has fewer access points to control than some of the older high schools, for sure. Of course you can’t just institute a metal detector program at one school in the district, or even at “the ones that are easy.” Besides, ultimately the metal detector controlled access to the school proper just sets up a killing field on the school grounds, so does it really accomplish much? So let me get this straight…. This little wimp is scares of school because of “lax” security. So, his solution is to sue the district, making them lost the funds they could potentially invert towards tighter security? LMFAO!!! Better yet, why not sue the city because I can get hit by a car at any corner? Get rich quick anyone? This little wimp was shot in the arm. You get shot in the arm and then you have a claim. Wait? You’re defending this family’s action? Wow. It’s people like you that make this country so sue-happy. He got shot… Yes. Painful? Probably. But if he got shot in a drive by, would you still feel the same? Would you condone him suing the city because there are not enough deputies on the streets? Come on. Think before you speak. Calm down and read it again. One doesn’t call someone a “little wimp” while defending them. He was being sarcastic. Hey, here’s an idea, come back and make a comment when one of your kids get shot at a school.. that’s if you even have kids… Better yet come back and comment when your mother gets shot! Have a wonderful day!! Your cousin was outside of a business? I don’t see how a business would be responsible for his injuries if he wasn’t in the business. When you go to school, there is an expatiation of being safe. Mark…”in front of” a business might still be their property. If the business is in a strip mall then in front of it would belong to the center development group. I’m not saying it would be or should be a winner, but unless the “in front of” means out on a public sidewalk there is someone who could be sued. Listen here, Pauline. MY son HAS been shot; Defending this country overseas, for morons like yourself to open their mouths. Making it personal doesn’t change the fact that this kid is trying to get rich quick. With your logic, my son should sue the United States government because they said he’d see the world. They never told him he would get shot. This kid could’ve gotten shot anywhere else in the city and YOU wouldn’t even care. Hypocrite. Thank your son’ for his sacrifice. When you join the military, you know there is a chance of defending our country. Military personal are trained for war like situations. Even military personal who are not on the front lines get trained. If you join the military you know exactly what to expect. Since we’ve been at war since 2003. If you say your son was shot defending morons, he was shot defending the constitution. Which includes Freedom of Speech. Which you practiced in this comment, as well as Pauline. I’m not taking anything away from your son. He’s a hero. The two situation are completely different. Thank you Mark. My son jokes about recruiters promising the world and quietly omitting the truth. Was it expected? Yes. My point to her “opinion” is that we cannot allow 1 to set the precedent. Can you imagine all the lawsuits since Columbine? Wow! No need to take it to that limit lady! Calm down! Just stating my opinion! If suing the district makes them feel justified and maybe win or maybe lose the case… So be it ! No need to get all nuts! We are all just giving our opinions!!!!! Sorry for stating some truth Pauline. The fact of the matter is, if this case wins, EVERY victim of EVERY crime will sue ANY establishment because of this precedence. It is impossible to expect armed personnel at every place at any given time. First, this high school. But, what if it moves to KinderCare or even the park? The school has insurance to cover lawsuits. The money is never taken from education. It’s all insurance. AVHSD doesn’t train like they should. They didn’t even have an emergency evacuation plan in place for injured students when my kids attended. You would be shocked at what the district suits get away with. PROOF HE WAS A BULLY, OR JUST GOING BY WHAT OTHER PEOPLE HAVE SAID? @Christy…This boy didn’t even know the shooter. Robert Ruiz Dominquez now has a rod in his arm and probably won’t be able to pay the violin that he loves. Your entire comment is filled with hate. The other boy was kicked out of this school and decided to return with a rifle and start shooting randomly. Your lack of compassion is disturbing. Could you provide some sort of corroboration for the following statements you made Alexis? 1) This boy didn’t even know the shooter. I am not saying this isn’t true, I just have not heard this anywhere else and it doesn’t immediately strike me as likely. 2) The other boy was kicked out of this school. I have heard that he transferred to another school, and that he and his parents pursued the transfer due to a bullying situation. I do not consider that source any more reliable than you, but I can’t say they are clearly unreliable either so I’d appreciate clarification. Again, this is something I just haven’t heard anywhere else. I have heard that he was mostly firing into the air, which makes sense as he only hit one kid when he clearly had plenty of opportunities. That would seem to indicate that his choosing to lower the rifle and actually shoot at a kid wasn’t likely to just be a kid chosen at random, but there is obviously a doubt as to just how far logic can be applied to such a situation. @Tim…Another news source (KTLA). There was another news source earlier on when this happened. The kid told his dad he fired in the air. If you look at the injury you can see that if he was firing in the air, wound would be different, that is, if the bullet fell from the air onto this boy. You can apply your logic any way you want. I’m just going by several news sources other than just this one. I don’t fully trust any news source any more, but I definitely don’t trust someone’s comment about this boy being a bully when there is not one news source that states that. I think there is a preponderance of evidence that he was mostly firing into the air, else he’d have hit more kids. I never put any stock in the ‘falling bullet’ bit, so I’d say it is clear he lowered the muzzle for at least one shot. I also skimmed other news sources for this particular story ( I usually don’t think things are important enough to bother) and that’s where the ‘transferred over bullying’ came from. That doesn’t mean that the kid who got shot was the bully in question though. And as you say, news sources in general aren’t too reliable about verifying the ‘facts’ they report, so I’m putting the circumstances of his leaving Highland down as unknown. @Tim…I also hope this boy that did the shooting will be able to get the help he needs. It is always heartbreaking to see another boy that is harboring rage feel that the solution to a problem is to use a gun to cause pain to others. It seems that so many parents with troubled children also have weapons in the home that are easily taken. What do you think? Agreed on all counts, and I’d certainly rather see the boy’s gun owning father face the financial consequences than the school district. Also, Tim, the father of the shooter called an off duty cop who apprehended the boy, then called the sheriff, which leads me to believe the father is either a cop or family of one. Yeah, that was more or less my thought, though I’ve met plenty of “cop friends” who don’t hesitate to claim that said friend will take their side in whatever dispute they are called to without regard to the law. On the one hand, these cop-friends may just be blowharding, but on the other I wouldn’t put it past most cops I’ve encountered to put favoritism over law either. Maybe the cop is just a neighbor or friend of some sort rather than family or fellow cop. @Tim…I agree with you, that the father should be held responsible for his supreme carelessness, which could have ended with the deaths of children. The father knew of his son’s mental health issues, therefore he should have been careful. Well, technically he “should have been careful” even if he didn’t know. In Australia, when you apply for a license to own a gun you are required to submit your storage plan. If you are caught not following your storage plan your license is revoked. They don’t rely on “should be” careful, they make it a requirement. So the bully wants a pay out? Didn’t the shooting happen outside the school as kids arrived? Anyway, I hope he does not receive a dime. We need to find a solution to keep our children safe in our schools. We need to teach our children to treat each other in the way they want to be treated. Stop bullying. Stop hate. Life is too short. The victim was never a bully. Never even knew the shooter. Get your facts straight. Facts are straight, Pablo. Also, a kid that brings a gun to school to shoot other kids is the bully. The boy that was shot didn’t know the boy that did the shooting. The boy that was shot is the victim, and now he is a survivor. There seems to be a number of parents of kids from that school saying that yeah, he was a bully. As I recall from my long ago experience in high school almost everyone was, including me. Part of being adolescent males is dealing with hormones, frequently through dominance behavior and pack formation. You bully where you can, you get bullied were you have to, you bully some more. You don’t consider that somewhere there might be a “bottom of the chain” who is gonna come to school with a gun.